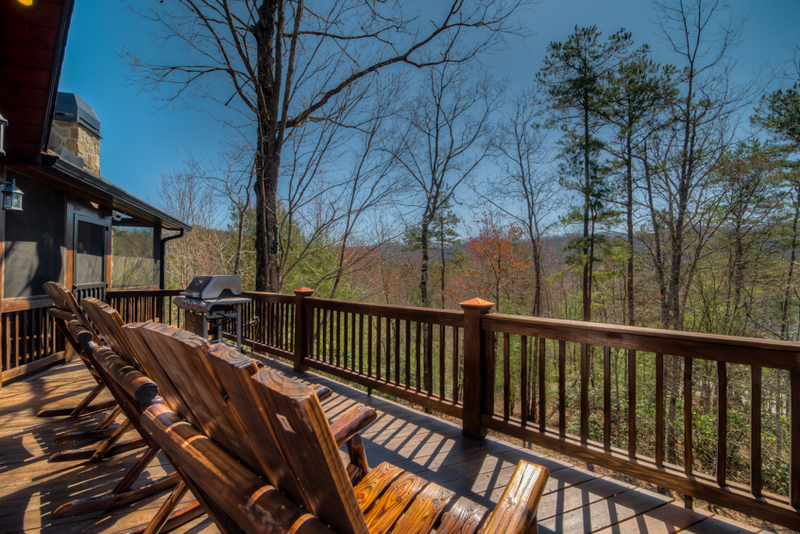 You have a lot of choices when deciding where and how to spend your vacation, and it can be overwhelming. 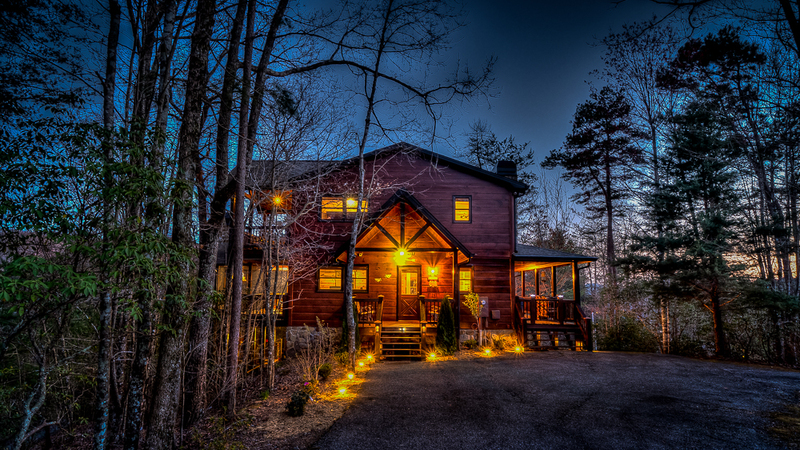 But if you want magnificent architecture, and first class amenities in a secluded setting less than five miles from downtown Blue Ridge, look no further than Hilltop Hideaway. 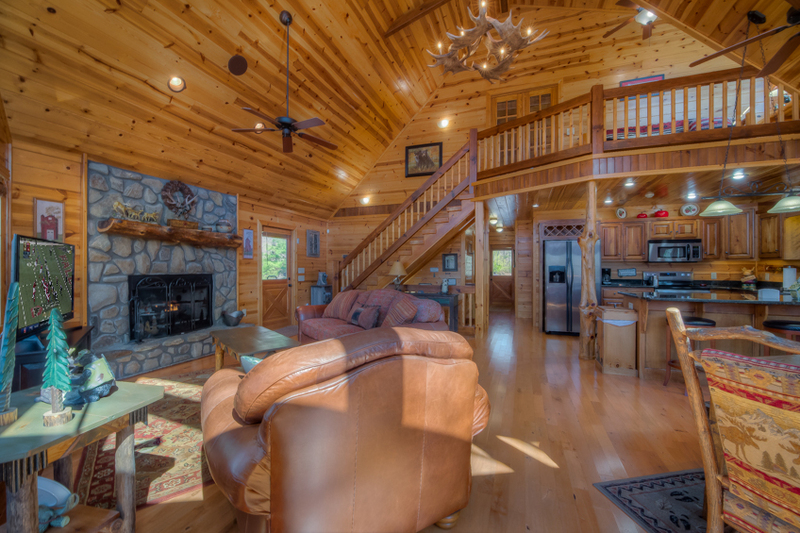 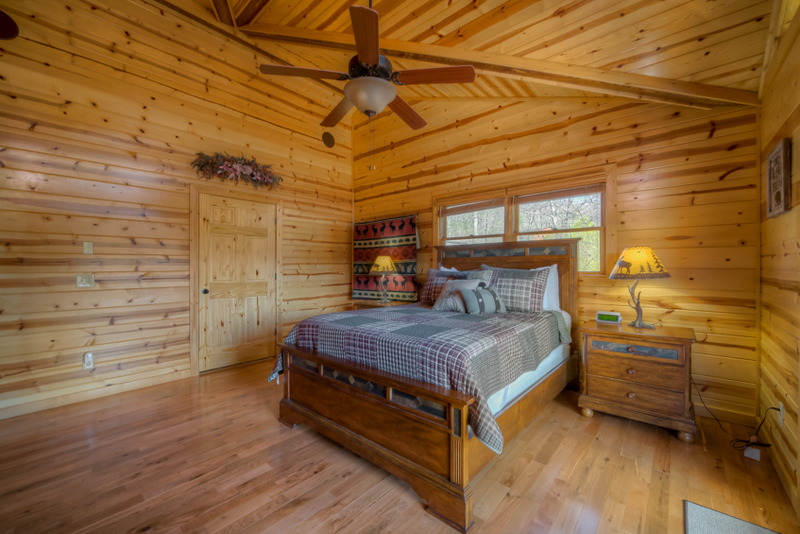 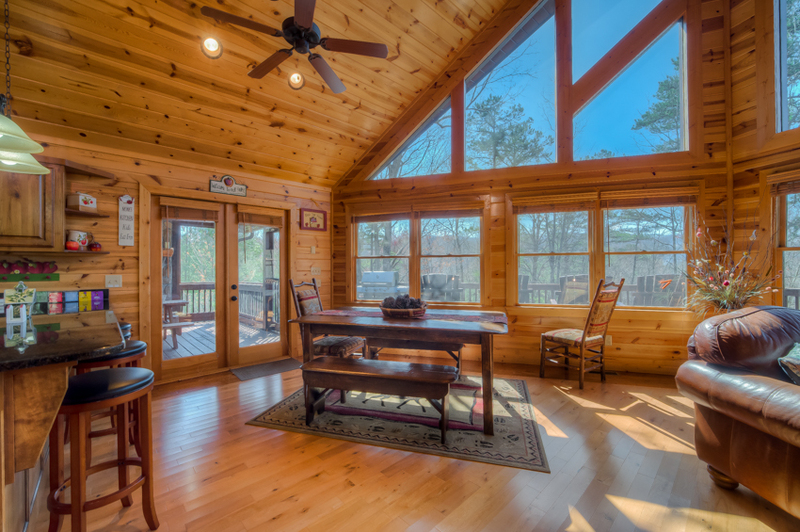 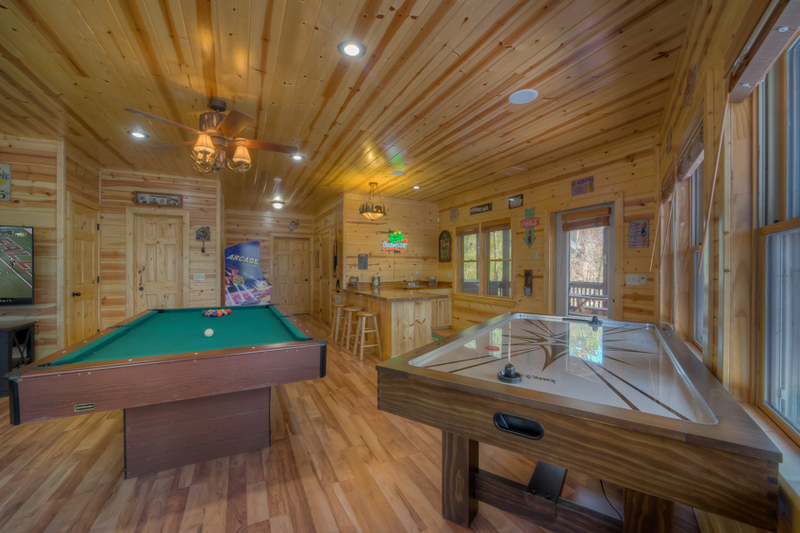 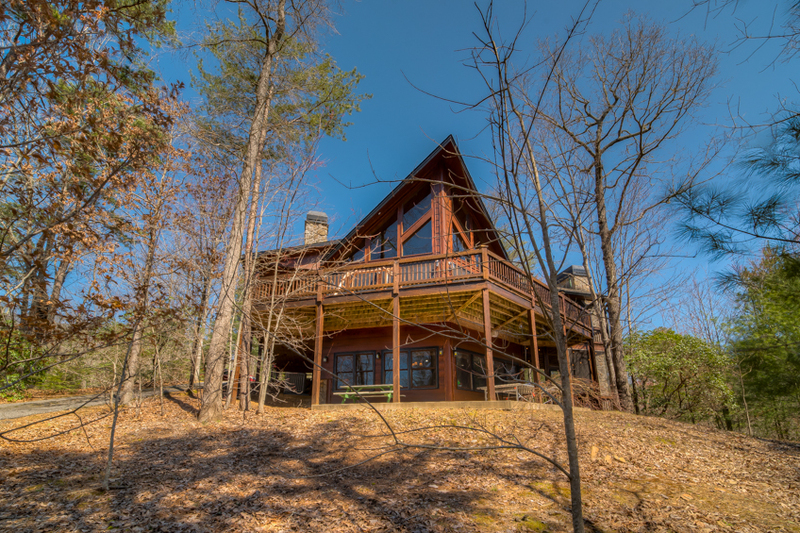 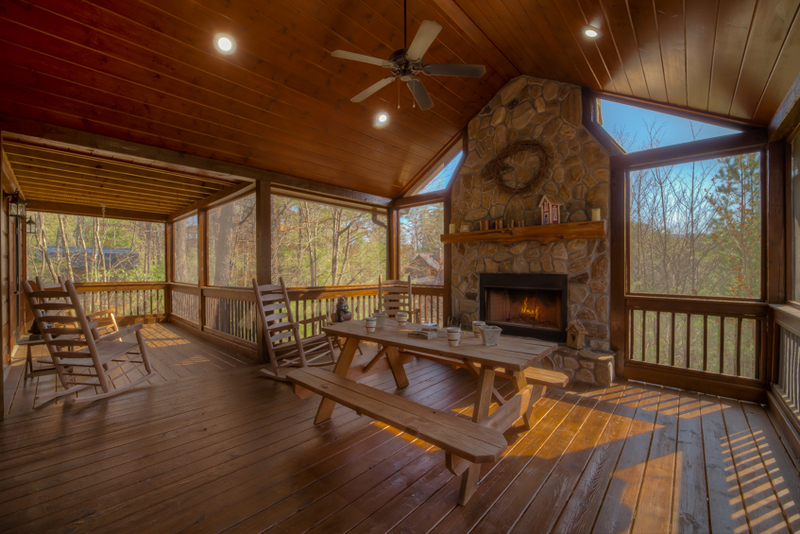 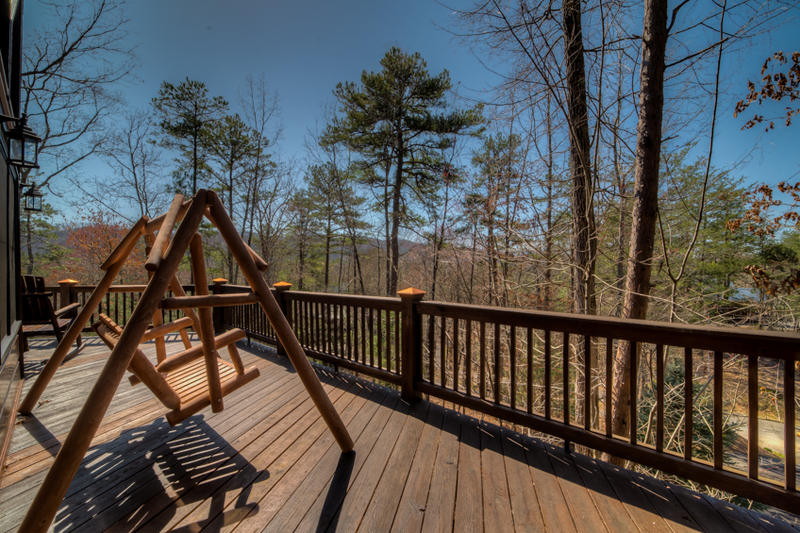 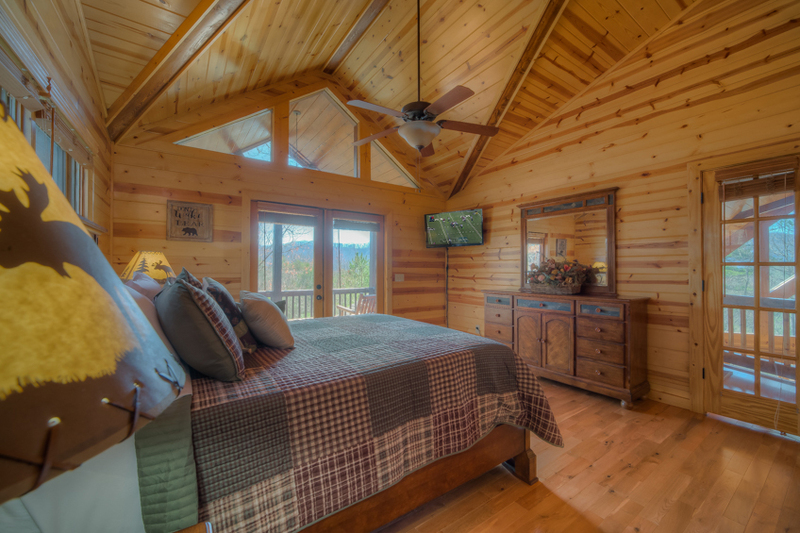 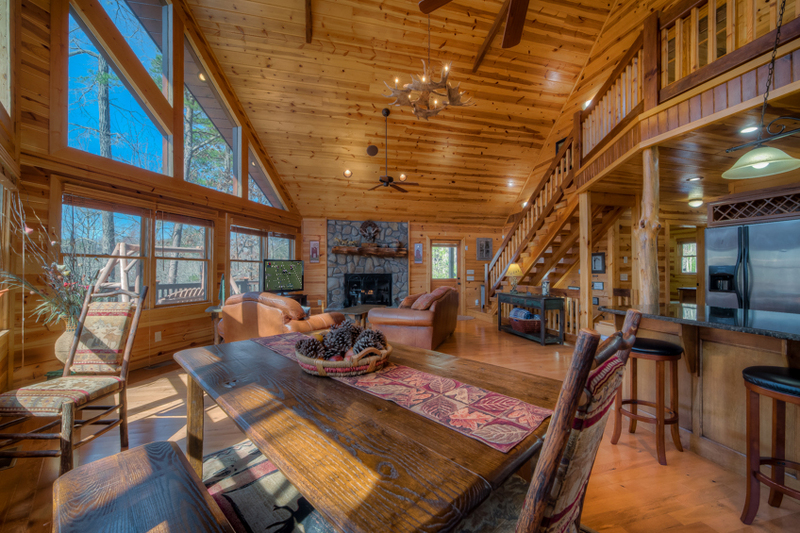 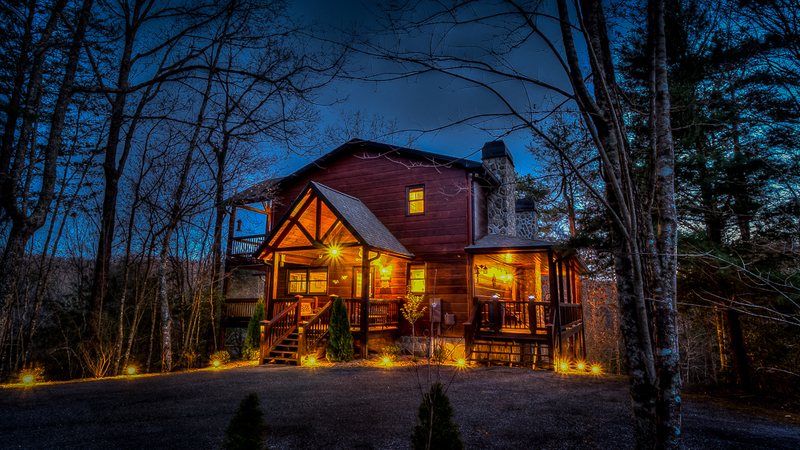 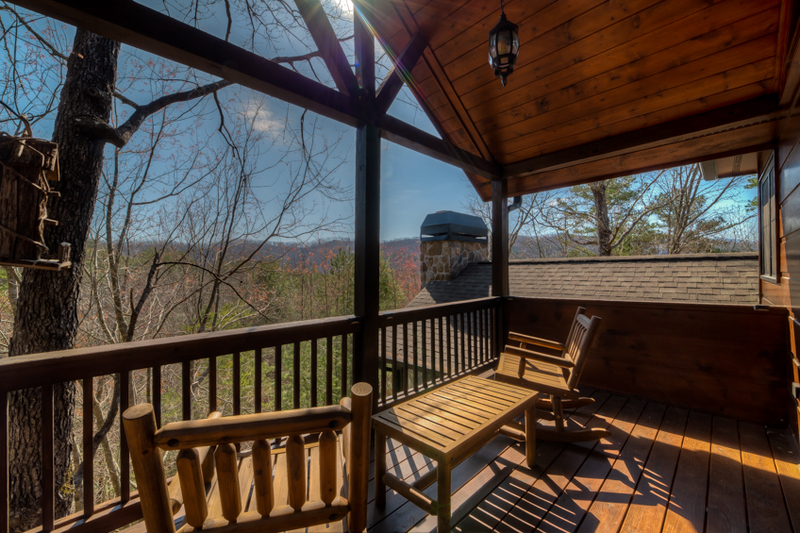 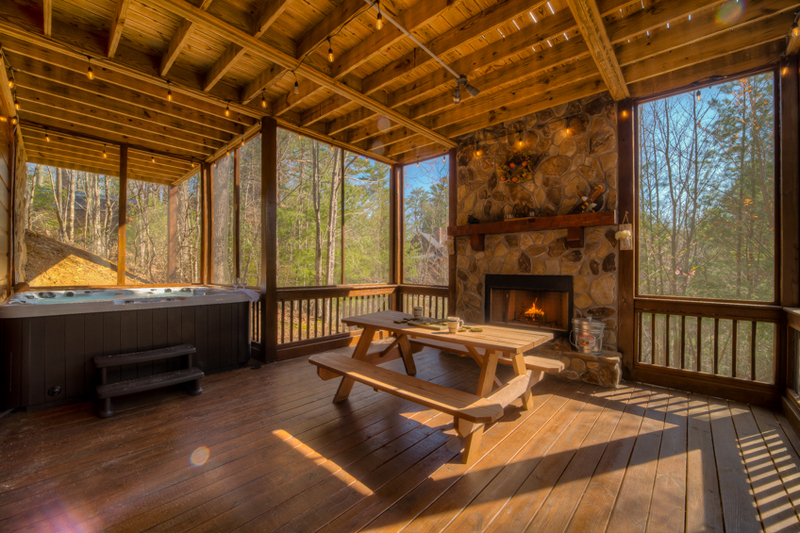 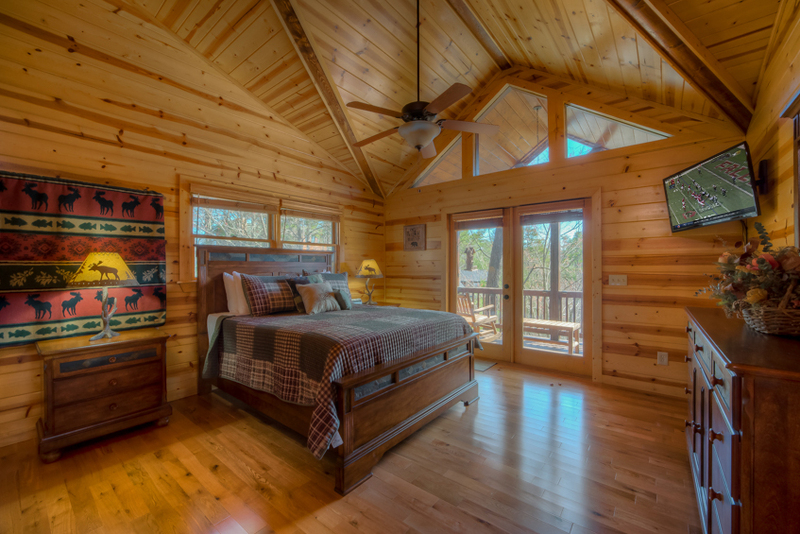 Truly spectacular inside and out, this Blue Ridge cabin rental is the perfect relaxing retreat to enjoy with family and friends. 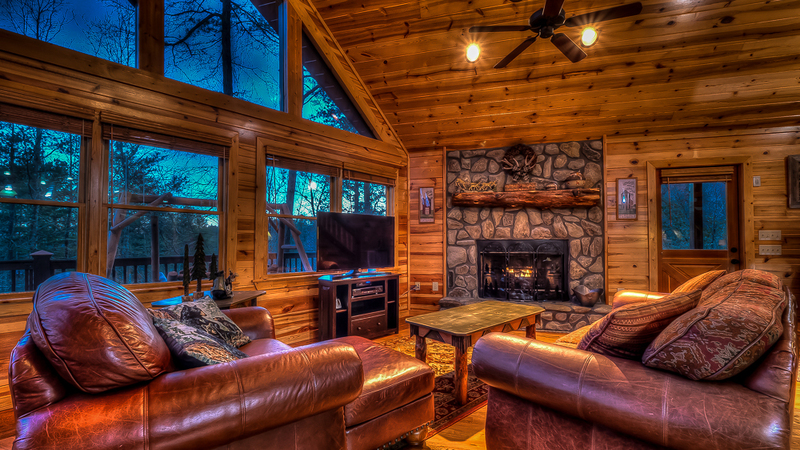 Located on a mountain with wraparound decks to showcase the view from every angle, the cabin is the epitome of rustic elegance, with plenty of country charm and a relaxed, welcoming ambience. 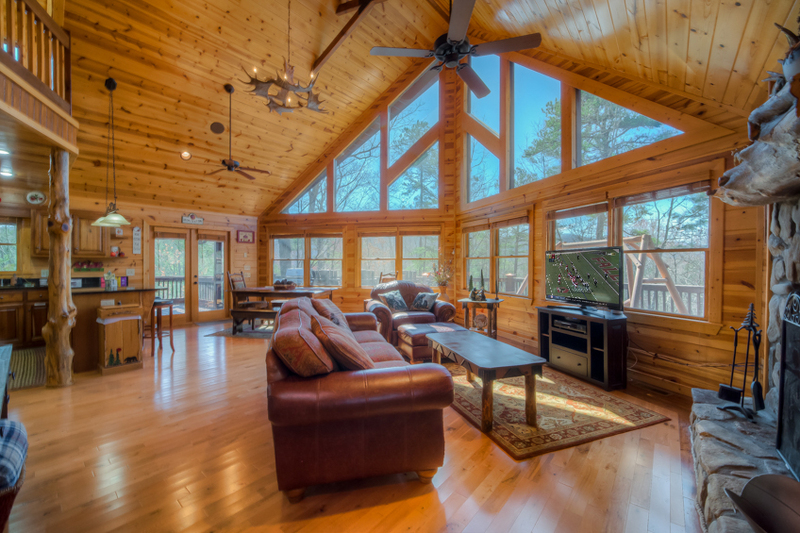 With its soaring ceiling and wall of windows, the living room is bright and airy by day and starlit by night. 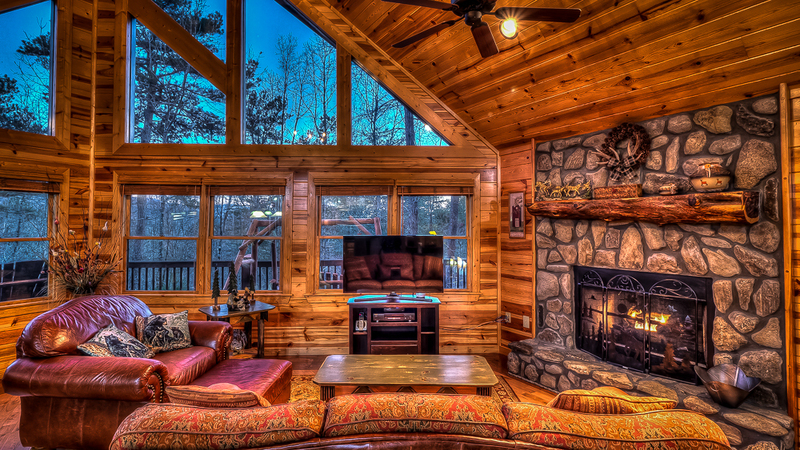 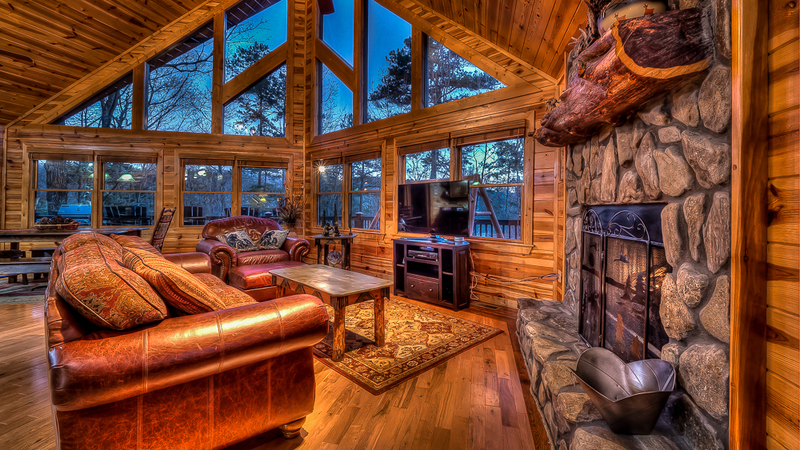 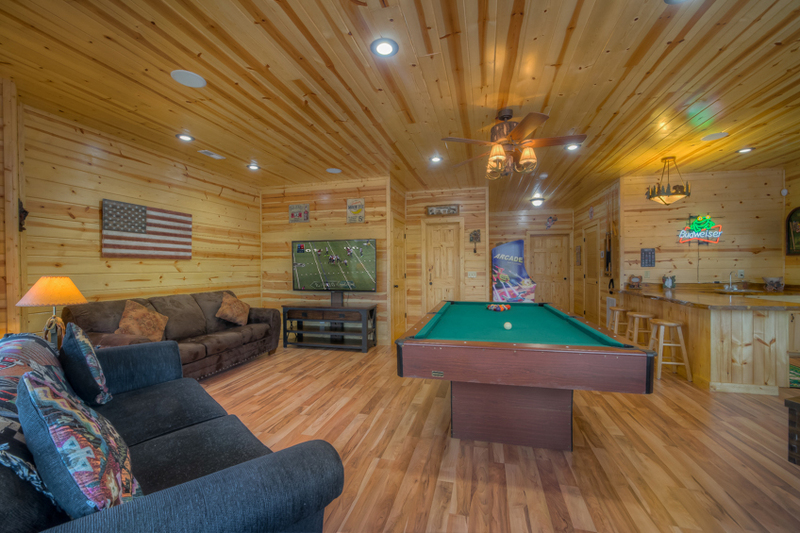 You can sink into a leather couch to watch TV, or relax by the fireplace, one of four in the cabin. 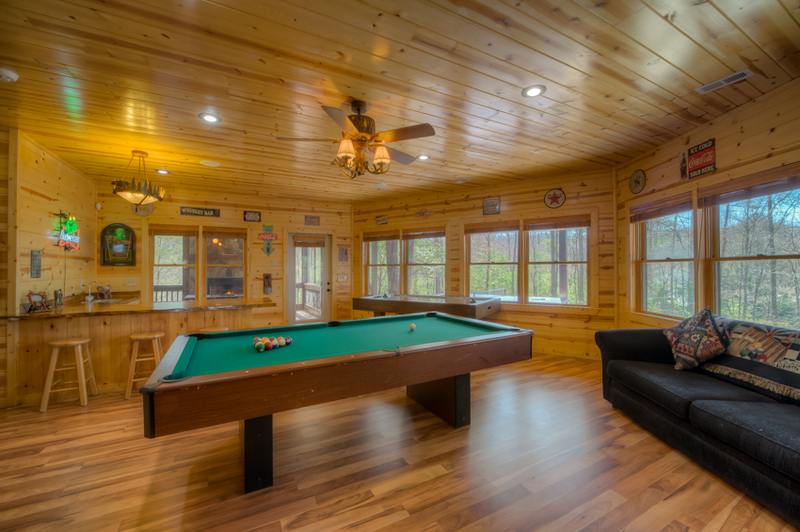 For more active fun, the downstairs game room is a gamer’s paradise, with air hockey, billiards, a classic arcade machine with 60+ games including Donkey Kong, a wood-slab bar, plenty of comfy seating, and a 65” flat screen TV. 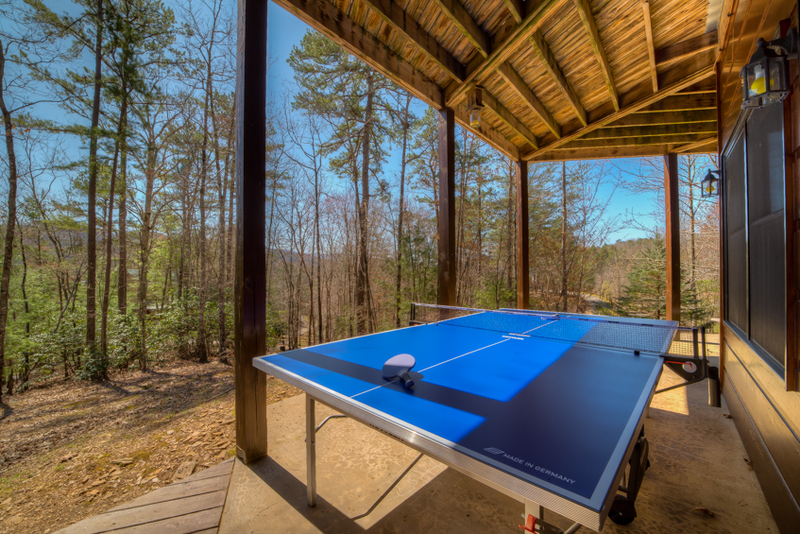 There’s also a fireplace, hot tub, and a ping-pong table on the adjacent patio. 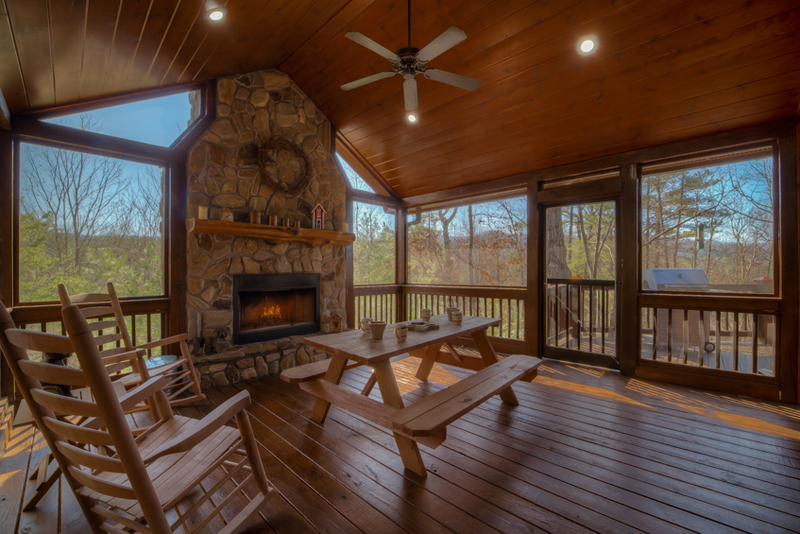 The two screened-in porches each have a wood-burning fireplace. 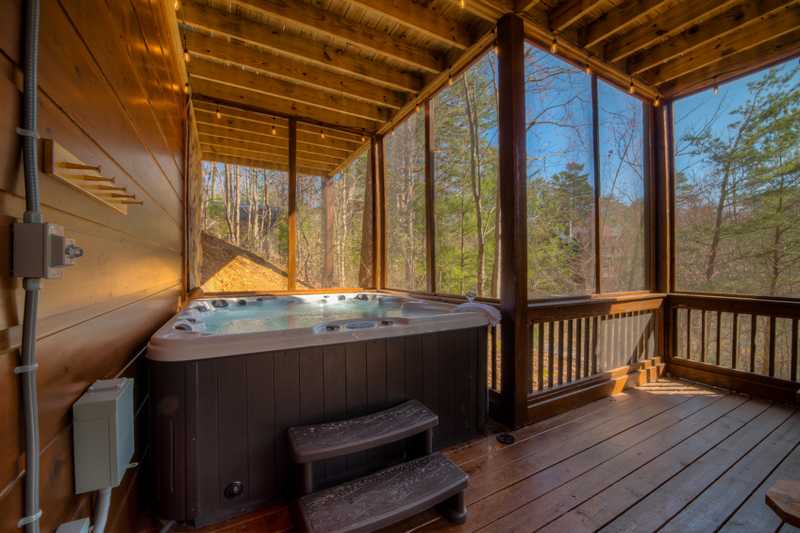 There’s a hot tub on the lower level porch, outfitted with Bluetooth speakers, and the upper patio has a large swing, six rockers, and a gas grill with a picnic table on the upper level near the kitchen. 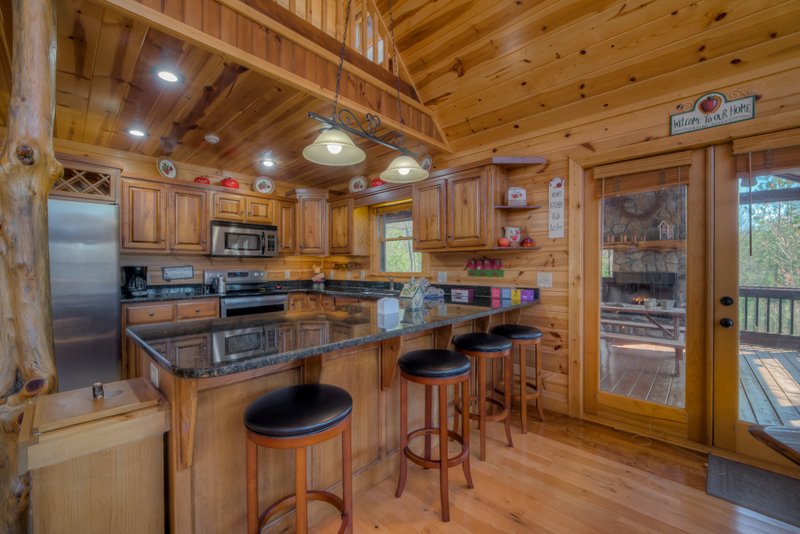 There, you’ll find stainless steel appliances, black granite countertops, wood cabinets, a wine shelf and all the appliances and utensils every chef needs, plus a waffle maker, crockpot, icemaker and drip coffeemaker. 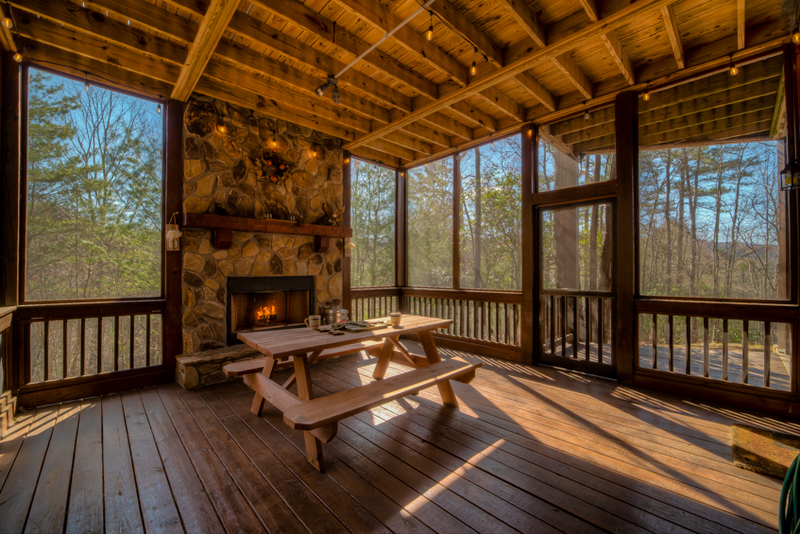 The dining table has seating for six, plus four more at the breakfast bar. 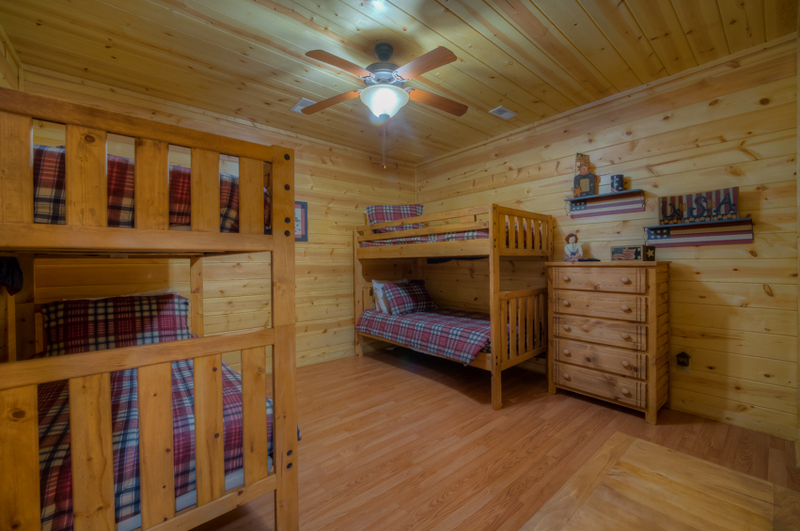 The three spacious bedrooms and a full-size futon in the open loft can comfortably accommodate large families, with two sets of twin bunk beds in the downstairs bedroom (and a detachable guard rail for safety). 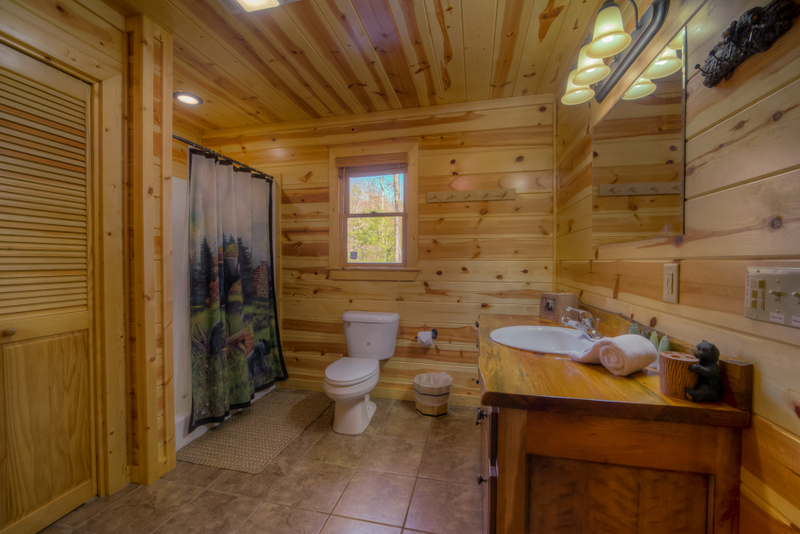 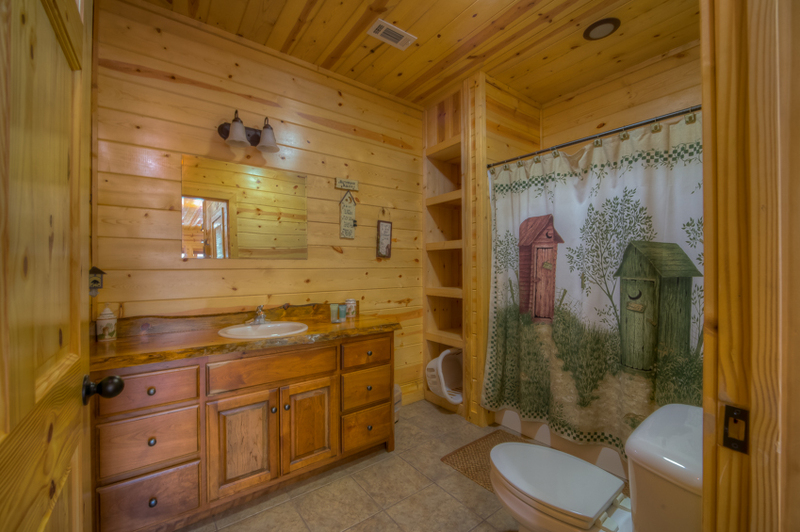 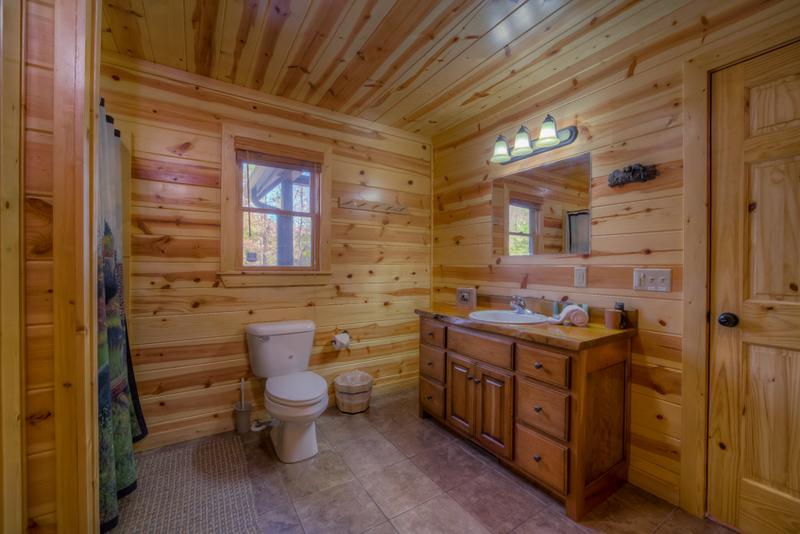 A separate bathroom with tub/shower is also accessible to the game room. 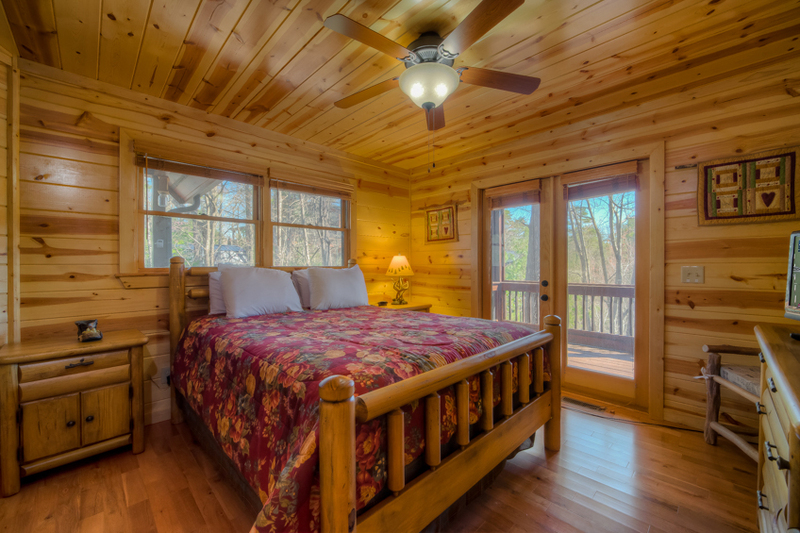 Upstairs, the master bedroom features a queen bed, 45” TV, walk-in closet, and a private screened balcony where you can enjoy your morning coffee while birds serenade you. 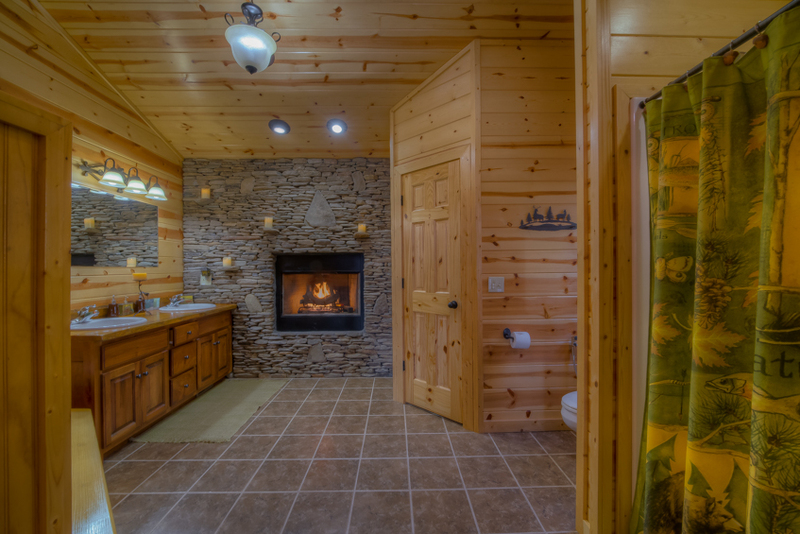 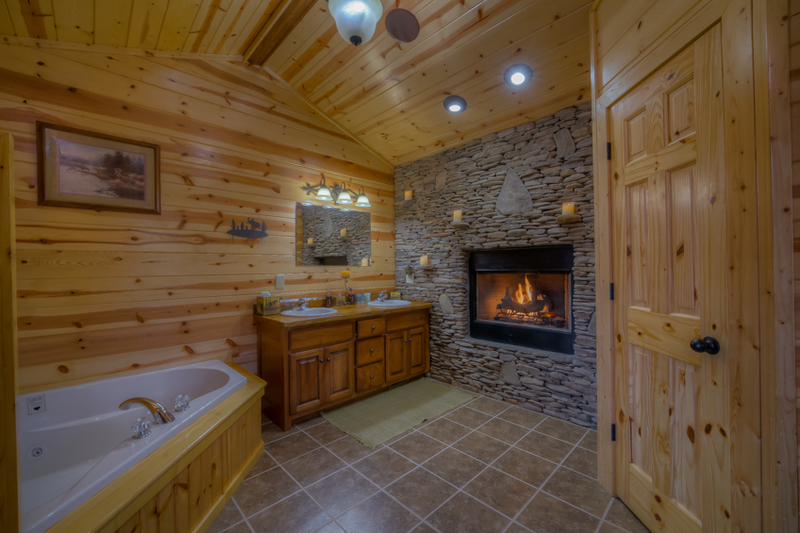 Its private bathroom has a standup shower, dual sinks, Jacuzzi tub, and gas fireplace with remote control starter and LED candles to set the mood for a romantic evening. 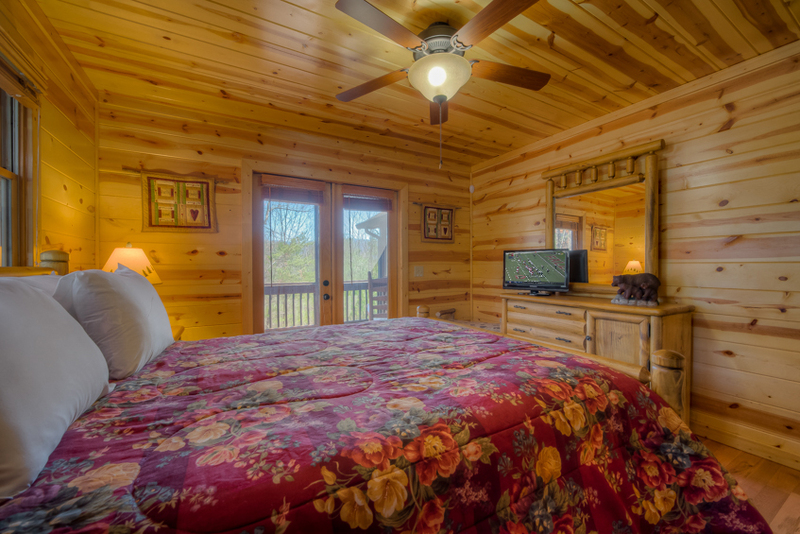 The main level bedroom has a queen bed, 32” TV, access to the wrap-around patio, and a separate bath with shower and washer/dryer. 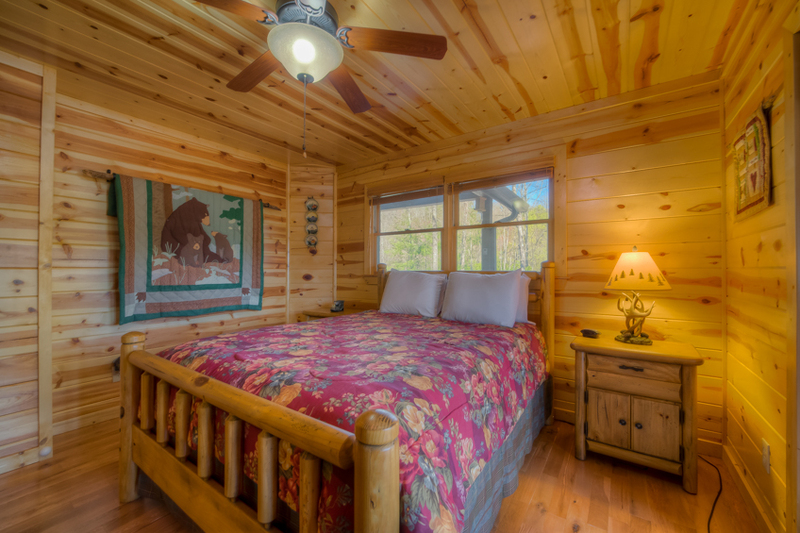 The cabin’s other amenities include WiFi, ceiling fans, and a paved road and driveway with ample parking, It’s just a short drive to mountain biking and hiking trails, waterfalls, antique hunting, zip lining, whitewater rafting and tubing, and popular destinations like Mercier Orchards, the Blue Ridge Scenic Railway, and great shops and restaurants. 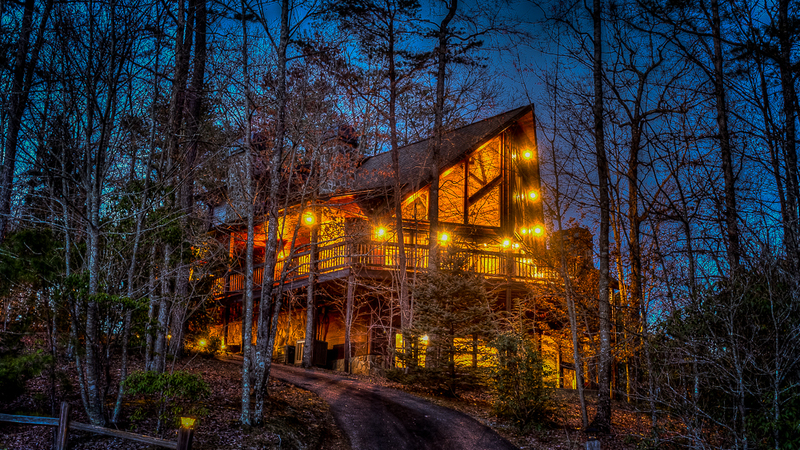 If you have dogs, you don’t have to leave them behind. 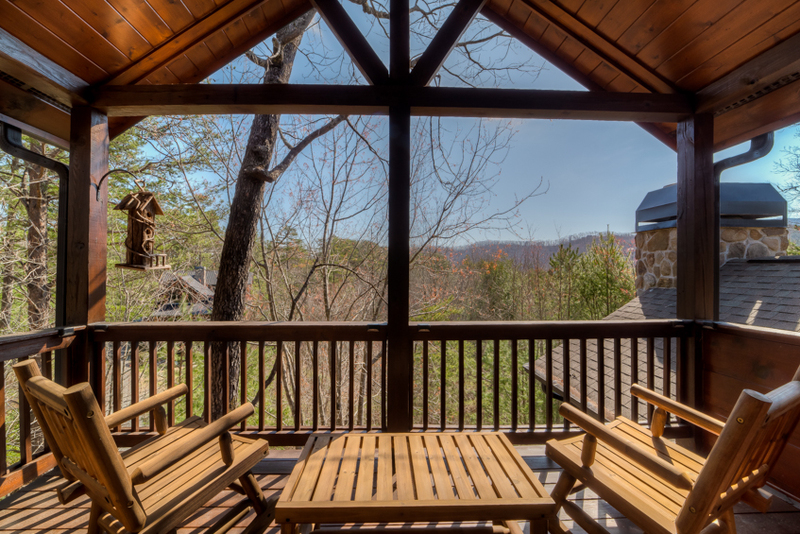 You’re welcome to bring up to two with you (as long as you pick up after them) while you and your loved ones create vacation memories at this very special mountain paradise.